The First Set Video from J.J. Abrams' Upcoming 'STAR TREK' Sequel! 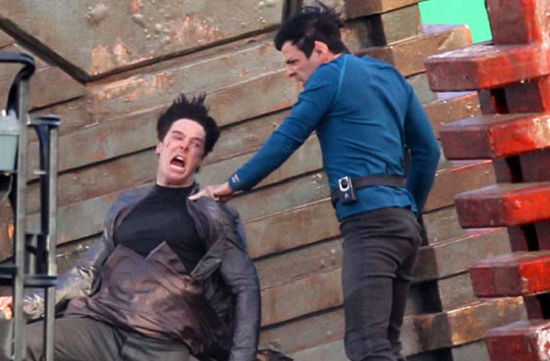 The first Set Video from J.J. Abrams' upcoming Star Trek sequel featuring Zachary Quinto & Benedict Cumberbatch has emerged online. Its basically the same scene from which last weeks leaked set photos emerged. Arriving in theaters on May 17, 2013, the movie also stars John Cho, Bruce Greenwood, Simon Pegg, Chris Pine, Zoe Saldana, Karl Urban, Anton Yelchin, Alice Eve & Peter Weller. Hit the jump for the details. Video Via SplashNews Online [via 5min]. I'm reading: The First Set Video from J.J. Abrams' Upcoming 'STAR TREK' Sequel!Tweet this!